A dozen or more years ago, in an article on "The Colonial Governor in the Literature" I lamented the general paucity of biographical studies of colonial governors and in particular of the more eminent of their breed during the last Colonial Service generation or two. Rereading now what I wrote then (never a sensible thing to do and always a salutary lesson), it is comforting to see how, through no effort of mine, a number of hopes have come to fruition. Today we have, as yesterday we did not, (auto)biographical studies or memoirs of, to name my modern African first XI, Sir Charles Arden-Clark, Sir Evelyn Baring, Sir Donald Cameron, Sir Geoffrey Colby, Sir Philip Mitchell, Sir Gerald Reece, Sir Arthur Richards, Sir James Robertson, Sir Bryan Sharwood-Smith, Sir Shenton Thomas and Sir Edward Twining, Of those no longer living, only Sir Arthur Benson, Sir Andrew Cohen and Sir Percy Wyn-Morris still lurk in the pavilion. Others, still living, have yet to take their guard, notably (for me) Sir Maurice Dorman and Sir Richard Turnbull. Now it is the turn of the twelfth man to bat. 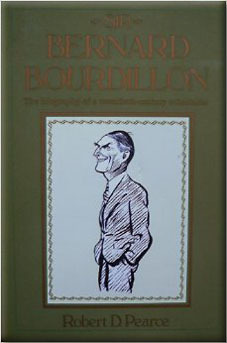 Sir Bernard Bourdillon. If the biographies vary in quality, with some being markedly better than others, then that is no more than a reflection of those governors themselves: even at the top there can be good, bad and indifferent among the incumbents of Government House, as any ex-Private Secretary will fervently confirm. Bourdillon was one of the few colonial governors, certainly of an African territory, to have come in from the Indian Civil Service (Evelyn Baring was another, so was Lord Rugby though not of a Colonial Office territory). He went to Ceylon as Colonial Secretary in 1929, after ten years' secondment to the new, post-war Iraq Political Service. His first governorship came when he was almost fifty, that of Uganda. Then came the Class 1 governorship of Nigeria, in 1935. Bourdillon was actually nominated as Governor-General of the Sudan in 1940 but at nearly 60 the Cabinet thought him too old for such a critical 'war-front' post. Instead he had his term of office renewed in Nigeria, where he remained till 1943. His three sons and one daughter-in-law all followed him into a colonial career, and his wife, Violet, played a unique role in colonial life (Pearce's complementary "partnership") - Dr. Pearce not only wrote a notable article about Lady Bourdillon in African Affairs some years ago but now dedicates his 400 page biography to her memory. This is a very worthwhile book, fact-brimming, scholarly and detailed, a little too long but only occasionally tedious. For a young scholar like Pearce, who was born after Bourdillon had died and when Nigeria was well on its way to independence, Bourdillon represents "the human, the acceptable face of modern British colonialism". After all, he was also a fine sportsman, a recognised ornithologist and a brilliant bridge-player, while a "Bourdillon" is still, many years on, an identifiable kind of trilby in Nigeria - "nobody should be seen without one", ran the advertisement in pre-war Lagos. A good colonial governor is remembered by much more than good governing. Pearce has made skilled use of official archives and of the privileged access to Bourdillon private papers granted him by the family. His publishers have done him something of a disservice by printing the index (a rather inadequate one, into the bargain) before the bibliography. On the other hand, they have done him proud in the quality of paper and typeface and at its modest price they put many another press to shame. For my part I could have done without the qualifying sub-title "A Twentieth-Century Colonialist", with its misleading modern undertones, and those who do not share my enthusiasm for Colonial Service biography and memoirs will have a point if they could have wished for a shorter book, possibly leaving just a few t's uncrossed or i's undotted - or even leaving some out altogether! But I am a specialist and am more delighted than I can say to have Dr. Pearce's authoritative and valuable biography available. As he says, there was no such composite creature as the colonial governor; "If we are to grasp them fully, we must grasp them in their individuality". Thanks to the efforts of Robert Pearce, Bourdillon can at last begin to receive publicly the credit long overdue to him: "He was", in Sir Charles Wooley's estimation, "one of the great ones (colonial governors) and one of the ablest of them all".